This has to be enabled if you use other products in combination with Captcha Breaker than GSA Search Engine Ranker. 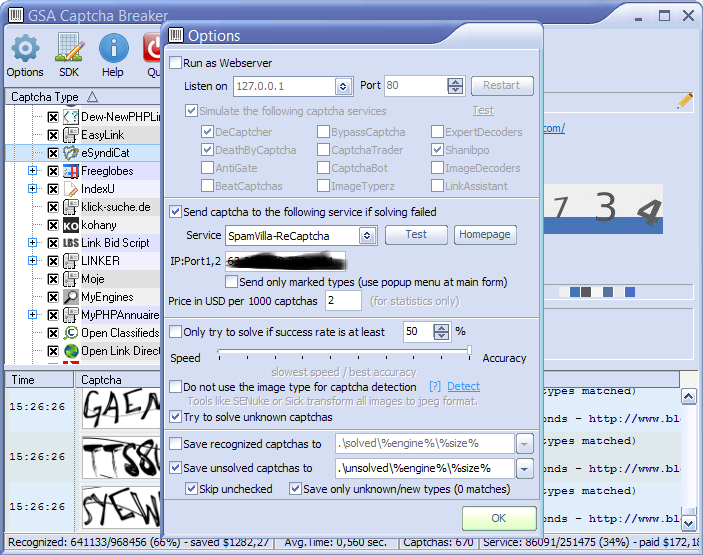 You must also check the Simulation of a captcha service. Choose one that is supported by the other software. On the other software you can enter any login, password or api key as that is not checked by the software. For LinkAssistant you need to check it after you have loaded the program. If you get an error, have a look here for some help to solve it. Sometimes you might not be successful in using one or the other captcha service even when checked and simulated by GSA Captcha Breaker. The reason is sometimes a direct use of the IP instead of the DNS (seen for death-by-captcha and de-captcha) in the other program. In that case look for a different captcha service. 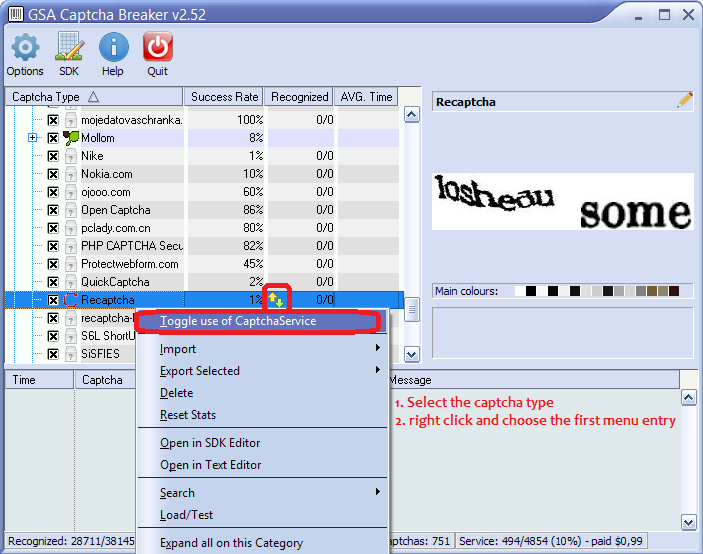 Of course you can not expect that GSa Captcha Breaker is solving every type of captcha for you. Some are hard to read by humans as well. So in that case you can choose this option to send unsolveable captchas to a captcha service of your choice. In the sample above you see the Service SpamVilla-ReCaptcha being used. This is useful when you use a captcha service for unsolvable captchas but still want to control what types to use for it. In that case you would go to the main form, select one captcha type and use the right mouse button to enable this option exclusively for this captcha type instead of using it for all. The the setting above, it will send the captcha directly to the captcha service and no solve by Captcha Breaker is done at all. This option is just for statistics and should show you how much money you spent and how many you saved (status bar at main form). This option will try to solve captchas that have not been defined in the program by using one of the best looking filter for that type of captcha. For best performance you should uncheck this one. Usually a unchecked captcha type means to skip the analysis of it and any other captcha type that might match as well will be ignored. This however is not wanted in special cases where you e.g. have defined your own definition for the same type. As the option indicates, this will save the captchas for later review.